Pori means literally tempering the ingredients in Tamil, that is the special in this rasam is to temper with proper ingredients,not to allow it to boil for long.Smell itself make us feel hungry. 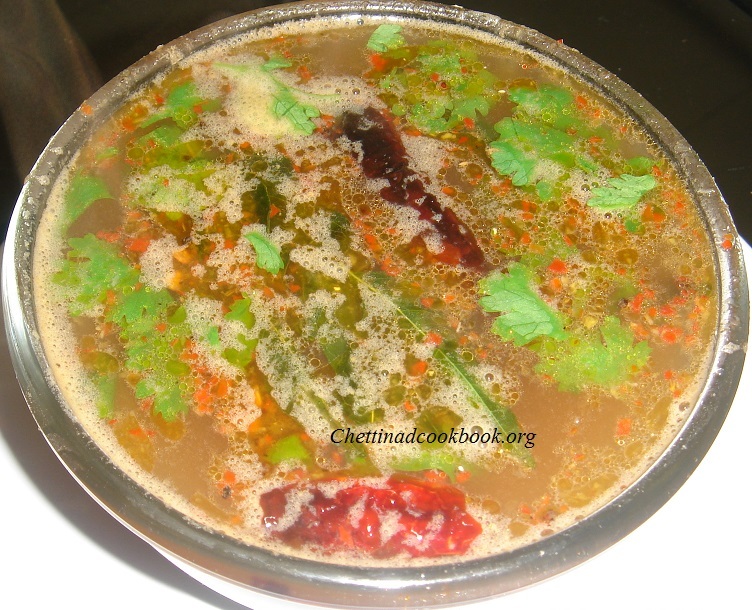 Rasam is mild, soothing for cold and cough also made every day for proper digestion, it can be served with rice or to drink hot as soup.In a traditional meal, it is preceded by a sambar rice course and is followed by curd rice. Only rasam with rice is suggested by doctors to have during fever such a good medicine harmless and easy to digest,pepper,cumin garlic, added in it reduces cough and cold.Rasam has a distinct taste in comparison to the sambar due to its own seasoning ingredients. We have variety of rasam recipe which tastes great,instant rasam is made without any tomatoes or dal boiled water.Can made in a minute, I always remember my brother when I prepare this instant Rasam,he used to say avasara rasam has it’s own special taste and aroma. This can be matched with any stir fried vegetables or paruppu thuvayal. Grind red chilli,pepper,cumin seeds,coriander seeds and Garlic in a blender or stone grind coarsely gives you better taste. Add the ground mixer in 2 cups of water,mix tamarind extract and salt ,mix well and keep aside. Heat pan with 2 tsp of oil season with mustard seeds and red chilli. 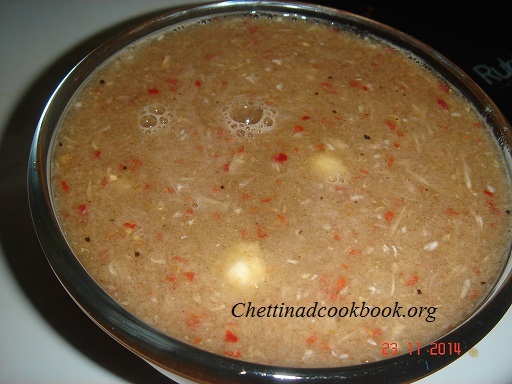 Sprinkle asafoetida,add curry leaves,Now add the rasam mixed water to it. Allow it to boil till forth forms do not allow it to boil for long time taste varies. Add chopped coriander leaves,serve hot. Note: Instead of normal water dal boiled water also can be added to enhance the taste.